As deliveries of the world's first plug-in diesel hybrid, the Volvo V60 D6 AWD, start in the UK, Volvo announced a new partnership with British Gas to help ensure customers' properties are ready to charge their new vehicle. the new model will be eligible for a free* car charging package from British Gas, which includes a charge point and free* access to the Polar Charging network across the UK. 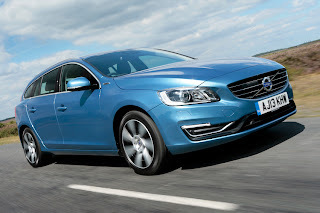 "The V60 Plug-in Diesel Hybrid has been a worldwide success and within the UK we have seen great interest from customers, both in the retail and corporate sectors. With the car offering low CO2 emissions coupled with a high power output, the new exterior design and Volvo's usual safety standards, plus this new fantastic offer from British Gas, we have great confidence in this vehicle as a complete package," said Iain Howat, Head of Product and Pricing at Volvo Car UK. Andreas Atkins, Head of Electric Vehicle Services at British Gas, added, "We're very pleased to be supporting Volvo and its new V60 Plug-in Diesel Hybrid. The V60 represents another step towards electric vehicles becoming mainstream in the UK, and this partnership maintains British Gas' position at the heart of the UK's charging infrastructure."